Discussion in 'Science Fiction & Fantasy' started by Samurai8472, Jan 11, 2019. I think some elements from it might have been incorporated into the show at some point, but the 1995 movie is in a separate continuity from the series. Never seen Turbo, so I'm not sure how that relates to the series. Also want to do In Space, Galaxy Lost, and the one where Rose McIver is the Yellow Ranger. That last one is RPM, and it's probably the best that Power Rangers has ever been. I’m a bit confused about when to watch the two movies (1995 and 1997). Where in the show are they set? The first movie is an alternate-continuity version of the story arc that opened season 3 of MMPR, so it doesn't count as part of the series canon. However, Turbo: A Power Rangers Movie is basically the series premiere for Power Rangers Turbo and thus should be watched right after the end of Zeo. Wow. Alot crammed into 21 minutes. We get our first Godzilla/ Ultraman type of a kaiju and it even breaths fire, I'm sure we'll get some regular talking MOTW somewhere down the line. I think this is the smallest villain force so far. Just two Druidon and some footsoldiers. Alot has been said that this series seems to be leaning more on Gingaman/Lost Galaxy than Dino Charge/Kyoryuger. The masters for pink and blue death was pretty brutal. I don't think anyone could have swooped in to save them. I hope Red piloting Three Knight KishiRyuoh won't be a frequent thing. Otherwise why do they need additional warriors? Interesting move to do the first henshin/morph at the END of the episode. Definitely subverted expectations of what a first episode consists of/ or how it should flow. Sometimes first episodes leave the opening credits out and just do the OP song while the action plays out. I missed the conclusion of Strongest Battle last week, but I found it elsewhere. A decent finale, with an attempt to give Rita some meaningful motivation for her evil -- with a disturbing implication that she'd been abused as a child by someone pretending to be a hero. Nice bit with SasoriOrange trying to reach out to her and redeem her. The rest was pretty much big noisy action as you'd expect. Was that the Gorenger theme playing over the final attack on Ultimate Dai Santa, err, Satan? Gaisorg had similar armor design to the Ryuusoulgers, so I wonder if that aggressive conquering tribe that was mentioned as its origin will be part of that series. Zi-O: Aww, I'm disappointed that Black Woz's Rider form is exactly the same as White Woz's. I was hoping for a variant, at least a repaint. This show is getting better now that they're moving past the tribute-of-the-week format and getting more deeply into the show's own mythology and character arcs. We're getting a deepening of Sougo's character and backstory, shifting allegiances among the various factions, and the like. It was pretty easy to guess last week that Tsukiyomi wasn't shooting at young Sougo, but at some baddie attacking him. Ryuusoulger: A lot crammed in, so it's hard to get a feel for it yet. Seems like a blend of Zyuranger and Gingaman, and various generational Sentai teams like Dairanger. Not a good sense of the main characters yet, except for the comic-relief lady. Lots of mentor-killing going on. Unusual to debut the giant robo in combined form before splitting it, and relatively unusual to do so in the first episode. I wonder if the Ryuusoulgers' tribe knew the Zyurangers' tribes back in dinosaur days. Maybe they're related? Unexpected continuity with Strongest Battle, with Ryusoul Green and Black (the two who appeared in the miniseries) being established as having previously left the village and already operating. Was that the Gorenger theme playing over the final attack on Ultimate Dai Santa, err, Satan? Supporting cast and villains have been announced. Kamen Rider Hattari the rival to Shinobi. It says "spinoffs" -- I guess that means video specials like they've done for a lot of the additional Riders in recent seasons? I shouldn't be surprised they'd go that route. It's a good way to give a taste of what their "series" would be like without actually having to wait years or decades to see them. EDIT: Although I see that Shinobi is the only future Rider getting a special so far; the second one that's been announced is a Ryuki reunion. There's no shared sentai continuity. There is when it's convenient to pretend there is, otherwise there isn't. I know that. It's just fun to play with the idea. "No.No.No. THIS has to have happened before this! There is no other way! Yeah. Some of the Kamen Rider Movie War crossovers are integral to the canon of one of the two crossed series but out of continuity with the other. Or sometimes the Movie War in a given season will be out of continuity but the summer movie starring just that season's Rider will be canonical (except for the cameo of the next year's Rider, which usually makes no sense at all). But anyway, since the Ryuusoulger premiere aired exactly one week after a crossover of all Super Sentai teams -- one that introduced Ryusoul Green and Black, in fact -- it's hard not to think of it as part of a shared universe. I loved seeing Geiz Revive use his speed to counteract Shinobi Futurering's vanishing. Geiz using his Armor to follow him and help fight was a sight to behold. Genius from whoever thought that sequence up. Looks like things are ramping for this week. Blade, Chalice AND Di-End. The woman Hikari Kajiwara who played Amane in the Blade TV show is back for the two-parter. She was just a child back in 2004. The Mystic Knights of Tyra Migo! The action scenes continue to be fantastic. How often do you get such an extended sequence of Rangers trying to take on a giant MotW on their own? And the MotW drawing on the lifespan of an actual human is a great way to introduce stakes. Seems like they've borrowed something elements from "Kamen Rider" this season. The goo going into peoples mouth was very disturbing. Bonus- The Toei Staff doing the Que Boom ending dance! Also. This weekend will likely be the last weekend of the Heisei era. A very big moment for sentai and Kamen Rider. We should have a new era by Monday. ^You're a month early -- Akihito is scheduled to step down (and end the Heisei period) on April 30. Zi-O: This was pretty inevitable -- the heroes have a falling-out and are headed for a final collision, but of course they patch things up in the end and restore the status quo. It is kind of odd to learn that Schwartz was the one who set up Sougo to be demon king in the first place, given that he's been leading the faction working to replace him with a different demon king. Are there two Schwartzes as well as two Wozes? 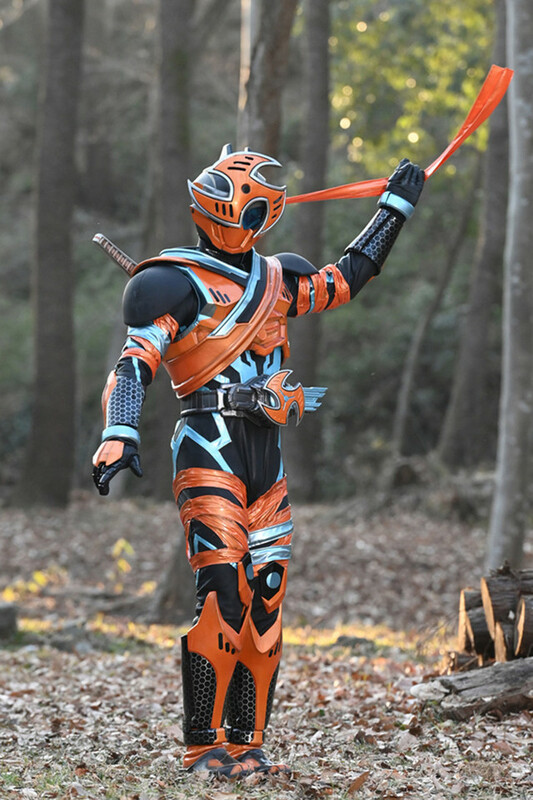 Next week's Blade crossover doesn't excite me, because that was one of my least favorite seasons, and Blade himself was possibly the blandest title Rider of the Heisei era. Ryuusoulger: A mixed bag, but it has promise. KishiRed is kind of a doofus. But the dynamic of the monsters leaching off the negative emotions and life force of humans is very Kamen Rider-esque, yes. There are shades of the Yummy from Kamen Rider OOO and the Bugsters from Ex-Aid. I agree that the action sequences are pretty fresh. Instead of the Rangers defeating a monster that then gets resurrected as a giant, the monster grows giant on its own. Seeing them fight it using only their RyuSoul gadgets was interesting, and there were some creative camera moves unifying the giant monsters and the live-action locations and stunt performers, a continuation of the sort of things we saw on LvP. Kind of silly, though, that the KishiRyuu assemble using LEGO-type connectors. And so the monsters aren't Minosaurs, as in dinosaur + minotaur, but Minusaurs, as in minus, which the Japanese have adopted from English to mean "negative" in every sense (like when GoGoFive referred to "minus energy" instead of negative energy). Beast Morphers: A decent character-driven story in which the Roxy avatar tricks Ravi into thinking his girlfriend's personality is still in her, so that he'll steal a piece of tech she can use to evil-avatar-ize him. Not bad for Power Rangers these days, but disappointing in that it seemed to reaffirm the one-dimensional "pure evil" nature of the avatars. It'd make for more interesting stories if they really did have some ambiguity and some chance of redemption. The episode also suffered from the fact that Jasmeet Baduwalia (Ravi) is still the weakest actor in the cast. They're still going backward through Go-Busters monsters; this week, the footage came from the very first episode of that series, and it highlights its novel take on the usual human-sized/giant monster dynamic, with the Rangers split up to fight both monsters at once and defeat them simultaneously. It’s has been confirmed the new era after heisei is called the Reiwa era. It comes from the Kanji 令和, coming from order/command and harmony. I wasn't expecting that to be announced for another month. Kind of a nice-sounding name. Interesting to have a culture where the name of each calendar era has to be chosen and its written symbols defined for symbolic and aesthetic reasons, rather than just adding up numbers. Does everyone in the show have a death wish? It was quite shocking that Ui would want to essentially commit suicide to stop the Minusaur. In a country where the leading cause of death among elementary and middle schoolers is suicide that was an odd moment. Just found out that according to the wikipedia Ui was at Mt. Fuji National Park in Aokigahara Forest in episode one. It's known as the suicide forest. The Asuna and Ui scene should have been around episode 14 or later in the series. It felt too early in the series. Have Green and Black have been killing the humans to kill the Minosaurs if they get too big (or was it to stop them from growing bigger? ), because they don't have their Kishiryus yet? Zi-O: Looks like that's a new kind of Ridewatch that Schwartz gave to White Woz. It creates the Another Rider in the present instead of the Rider's year of activity. Hmm, I guess it works in this case because Blade sort of ended in a stalemate, with Blad and Chalice's conflict necessarily unresolved, as will presumably be explained next week. It's unusual for a Zi-O tribute storyline to tie so heavily in the core storylines of the past series. Not only has WWoz apparently deliberately triggered the apocalyptic showdown that was averted at the end of Blade, but the Another Rider is Amane, and I'm sad to say she still seems to be driven by her teenage self's creepy obsessive crush on Hajime, who's about 10,000 years too old for her. I'd forgotten that Diend's power is to summon other Riders to fight for him. They seem to be using him as a way to pay tribute to secondary Heisei Riders. It was never clear to me whether the Riders he summoned were the actual people who were somehow being pulled out of time and brainwashed to fight for him, or just simulacra of some kind. Sometimes they were shown to have a will and personality of their own, but usually, as here, they were just obedient henchmen. I haven’t watched blade so I don’t feel the build up tension between both blade riders after so many years apart. You haven't missed much. It was one of the weakest Heisei seasons. Ryuusoulger: This ended up going unexpectedly dark. The green and black guys are pretty nasty pieces of work. And I agree, Ui's plot would've been better if it had come a bit later in the season, after the friendship is more established. 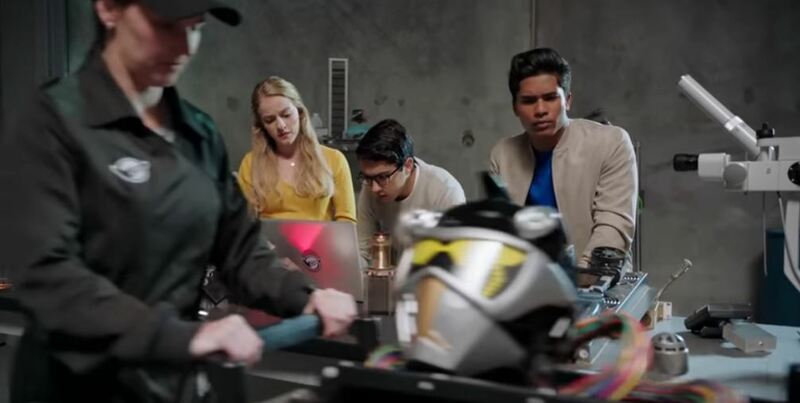 Beast Morphers: "Taking Care of Business" was a fairly good episode getting into Devin's tensions with his father again, as Mayor Dad tries to get him a job and his secret Ranger business gets in the way, reaffirming his dad's belief that he's irresponsible. At one point, when the Mayor was watching the Ranger battle, I thought they were heading for a Timeranger/Time Force-like reveal of the Red Ranger's identity to his disapproving father, but instead they ended on an ambiguous note. Anyway, the plot continuity is nice, with the story revolving around the aftermath of previous battles and evidently setting up future developments. Speaking of parents, they explained how Ben & Betty keep their jobs despite their constant bungling -- their dad is the general in charge of the place. The Sentai footage and monsters this week were from episode 4 of Go-Busters, and the capture of the intact MegaZord Gamma (GigaDrone Gamma here) led into the debut of the combined mecha Go-Buster Oh in episode 6, so I bet Beast Morphers is setting that up for next week (which will also be episode 6). They made a couple of changes, like having the monster based on a circular saw instead of a pizza cutter, and editing out the bit in the MegaZord battle where the cutting blade dug into Go-Buster Ace's cockpit and imperiled the Red Ranger. Still, the action footage is pretty impressive, a reminder of how novel and unconventional the action in Go-Busters could be. Hasbro made a good choice going back to it. By the way, speaking of GB's novelty, I've been talking about how unusual it was to have the the giant evil robots active alongside and in parallel to the human-sized robots/monsters, rather than being the same monsters grown to giant size. But I've learned that that's actually how it was done in the very first Super Sentai season with a giant robot, Battle Fever J in 1979-80 (the third Sentai series overall). The human sized monsters there had identical giant-robot counterparts that they called their "little brothers" (or sisters). Yeah... When it was established that Nate was collecting debris left over from the Tronics, I had a feeling he'd be using those special parts to make his robot friends. Trinity Form? I swear I've seen that before... but maybe I'm just Imagining things. Trinity for is even formed similarly to Climax. -Climax Form would kill for that Clock Room Zi-O Trinity gets. though. So much less cramped. This episode had some real powerful themes about changing fate. Sougo actually motivating White Woz, who was at the end of his resources, managed to find common ground. While Trinity Form doesn't quite represent a temporal trinity (past/present/future), it does sort of seem like an id/ego/super-ego setup. Then again, Woz has always had an ego, and now White Woz's ego has passed on to Kaito's role, who's more of a disappearing act than anything. Interesting that Oma ZI-O basically said "Look, you have to do six more tribute episodes before this thing wraps up." Dropping the duel and ignoring the monster-of-the-week to go find a Kishiryuu felt very jarring. Having a more mobile mecha suit is really paying off this year.